For anyone who loves the idea of living on the Mediterranean, but is put off by the elevated prices of the French Riviera, the city of Perpignan, close to the Spanish border, with its neighbouring seaside resorts along the Cote Vermeille, might be an excellent alternative, offering a lovely climate, beautiful beaches, and a fascinating mix of French and Catalan culture. 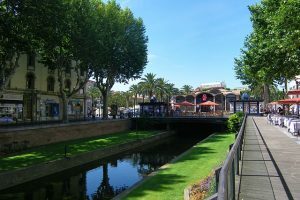 Lying just thirty kilometres from the Spanish border, Perpignan, the capital of the Pyrénées Orientales, is a popular tourist destination and former capital of the kingdom of Majorca. The city remains very much attached to its Catalan roots and culture, with many street names displayed in Catalan as well as French. In 2008 it became a Capital of Catalan Culture. In restaurants, both Tapas and traditional French dishes are widely available. Many will feature locally produced ingredients such as figs and olives, and are often accompanied by the Catalan speciality Pa Amb Tomaquet, or bread covered in finely chopped tomatoes with olive oil. Perpignan is an attractive city with a well-preserved historical centre, through which the river Basse flows, with beautifully planted gardens along its banks. There is much to see and do, with interesting monuments, annual festivals and a recently-opened indoor fresh produce market. The station, once declared by artist Salvador Dali to be the centre of the world, is well serviced, with high-speed TGV trains stopping at Perpignan between Paris and Barcelona, and other services to Narbonne, Montpellier and Avignon. There are regular scheduled flights between Perpignan Airport and London Stansted, Birmingham and Southampton with Ryanair and FlyBe. The Cote Vermeille is a stretch of beaches and bays that start south of Perpignan, and include Argelès-sur-Mer, the beautiful fishing village of Collioure, Banyuls-sur-Mer and the border town of Cerbère. The area also produces Banyuls fortified dessert wines, which are widely available in shops and restaurants. With a sandy beach of almost seven kilometres long and a backdrop of the Albères mountain range, Argelès-sur-Mer is extremely popular among water sports enthusiasts, with windsurfing and scuba diving practised. There is also a lovely 3km long promenade, in part backed by a large pine forest, and a tree-lined port teeming with restaurants. A short distance inland, Argelès is a pleasant Catalan-style town with narrow streets and an historic bell tower, located in the Church of Notre-Dame-del-Prat, which once served as a lookout post and signal station. At 34 metres high, it is open to the public and offers wonderful views across the region. 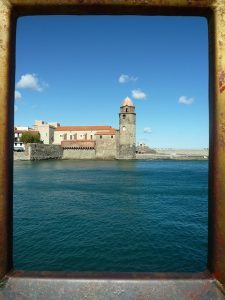 Arguably the jewel of the Cote Vermeille, Collioure is a popular tourist destination, with a lively medieval town centre, a royal castle, a lighthouse turned church, and a beautiful beach and harbour. The summer residence of the court of Majorca between 1276 and 1344, Collioure was transformed into a Spanish border fortress at the end of the 15th century and became French in the mid 17th century. More recently, Collioure became famous for attracting Les Fauves, or wild beasts, an artistic movement led by Andre Durain and Henri Matisse which included Georges Braque and Raoul Dufy. The movement, characterised by wild and bright colour combinations and brush strokes, may have been short-lived, but Collioure takes great pride in its contribution to it, and remains a popular place for artists to live and work today, with the narrow streets of the old town lined with art galleries and boutique shops. The author Patrick O’Brien also lived in Collioure between 1949 and 2000, writing almost all of his sea-faring books there, and is buried in Collioure. Anchovies are one of Collioure’s key industries, resulting in the town being awarded the ‘site remarquable du gout‘, or award of culinary excellence. They are prepared in many different ways and are widely available in shops and restaurants. Banyuls-sur-Mer is a coastal resort and scuba-diving centre set around a natural bay and port. The town itself has attractive narrow streets which wind steeply uphill, and above lies the Jardin Mediterranean du Mas de la Serre, a park filled with plants from around the world that are suited to the Mediterranean climate. Banyuls also has an aquarium on the seafront filled with plants and fish found in the waters nearby. Banyuls is also well known for its sweet and dessert wines, with the most popular places for wine-tasting being La Grande Cave and La Cave du Mas Reig. The pretty border village of Cerbère is an important centre for diving and the location of France’s first marine reserve, the Cerbère-Banyuls National Nature Reserve, established in 1974. Cap Cerbère is a rocky headland, and has excellent views of the Catalan coast. The village’s most attractive building is the art déco style Belvédère du Rayon Vert hotel, designed by the Perpignan architect, Léon Baille, and built between 1928 and 1932. Styled to resemble a ship, it has a cinema and a roof tennis court, and became an historic monument in 2002.